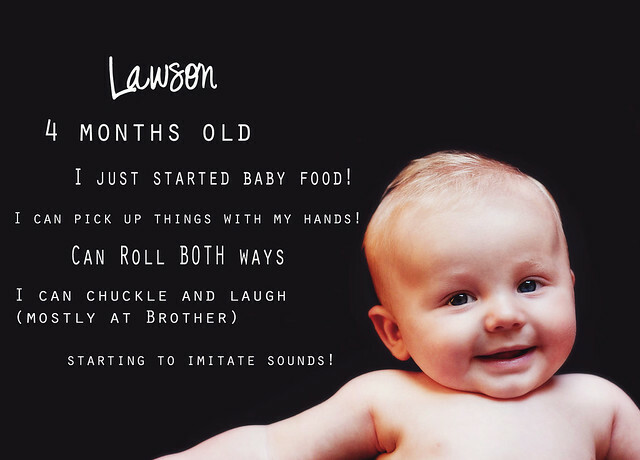 Since Lawson has been born I've made a point to take a photo of him each month and documenting his milestones on them. I only wish I were this advanced in photography with my first and did it with him as well. But I will start doing a yearly photo with him and when school starts. 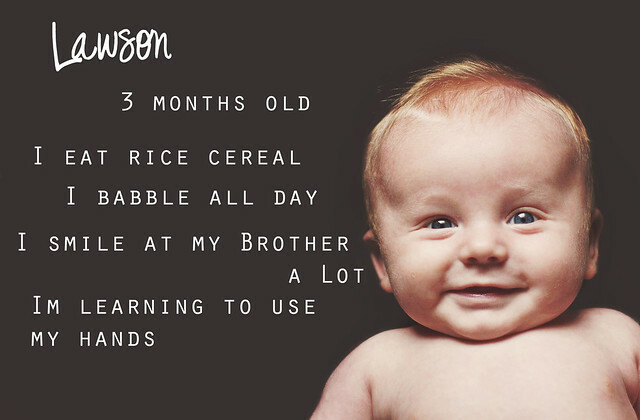 So far I've taken 4 photos of Lawson since he's four months old. I have his weight and measurements recorded but tonight I'll share his most recent stats! We had his 4 month checkup today and he was 15 pounds and 26 inches long! Big, healthy boy! He is in the 75-90th percentile height-wise! Potentially tall one we have here. He got three shots, which were hard on me, even harder since the big boy got one too (his flu shot). I loved the hurt right out of them though and they came out fine. I'm gonna share the milestone photos I have taken of Lawson so far, you can see the HUGE difference a few months make in an infant (as if you wouldn't already know if you have children)...and here they are! As far as his habits he is an amazing night sleeper...goes to bed between 8 and 8:30 and sleeps until between 4 and 6 and I usually just pick him up and he's right back to sleep. Sometimes he wants a bottle but either way he goes back to sleep until 8 or 9. Dillon goes to bed at 9 and sleeps until 8 or 9 as well. 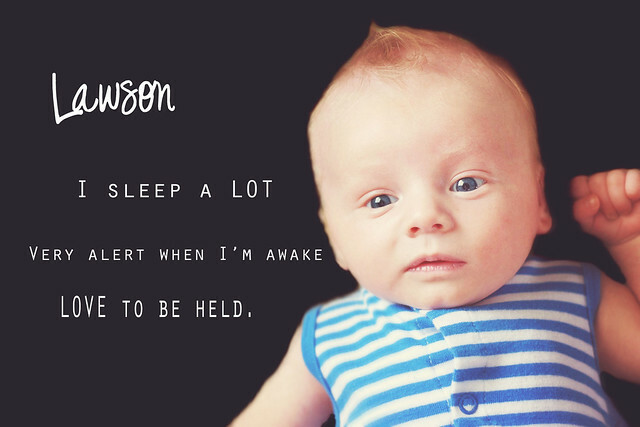 Dillon doesn't take daytime naps anymore and Lawson doesn't take long ones. Usually three per day and they're about 45 minutes max in length. I'm very thankful for healthy boys and cherish them so much! They make me happy and proud to be their Mother everyday!